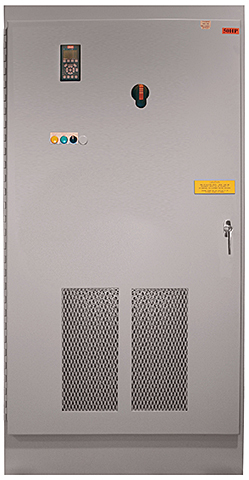 Variable Frequency Drive combines harmonic reduction technology with bypass and disconnect in a single, compact package. The Multi-Pulse Packaged Drives are available as a 12- or 18-pulse harmonic reduction solution and deliver 15 to 250 hp performance at 360-480 VAC operation. Helps satisfy, at the system level, IEEE 519-1992 guidelines for current distortion limits for VFD installations.